Let's go to the grocery store! I’m a self-admitted grocery store junkie. Hitting up 2-3 markets on a given shopping day isn’t outside my comfort zone and I can endlessly trail the aisles at interesting or new stores for hours. Why? I think it’s my inquisitive nature, born out of my desire to learn about the cultural implications of modern food purchasing. NOT! It’s because I love delicious food in pretty packaging! So when my friend Fritz (yes, that’s his name, amazing right?) recommended I visit Super King Market in the far outer reaches of Los Angeles (I think they call it Burbank? ), I just had to try it. Was I in for a show! The best thing about non-traditional supermarkets that cater to ethnic populations is just how much of their traditional cultures are inflected into the stores. Crazy old Korean ladies bumping into you constantly as you grab their prized head of cabbage. Stubborn Armenian women that just dare you to move their cart out of the already-congested produce section. I could go on. I could also show you the bruises on my elbows. Super King was other-worldly in its representation of ethnic cultures doing what they do best – picking, haggling and hoarding their favorite foods. The buzz of people in the produce section was incredible; you could barely move your cart, let alone alone walk through some of the sections. People were grabbing the sale fruits and vegetables like the megaquake is on the calendar and this was their last shot at filling the pantry! Needless to say, very fun experience. I eventually abandoned my cart in an empty section and proceeded to make runs back and forth with my goods…always with an eye on my stuff…Yeah, I see you little old Persian lady with the kerchief. Keep your hands off my eggplant! The store had a great selection of produce you don’t see at traditional markets (hello, garbanzo beans in their shell, where have you been all my life! Good for fueling my obsession!) and some great fetas from Greece and France, as well as my new favorite discovery: Menaesh. 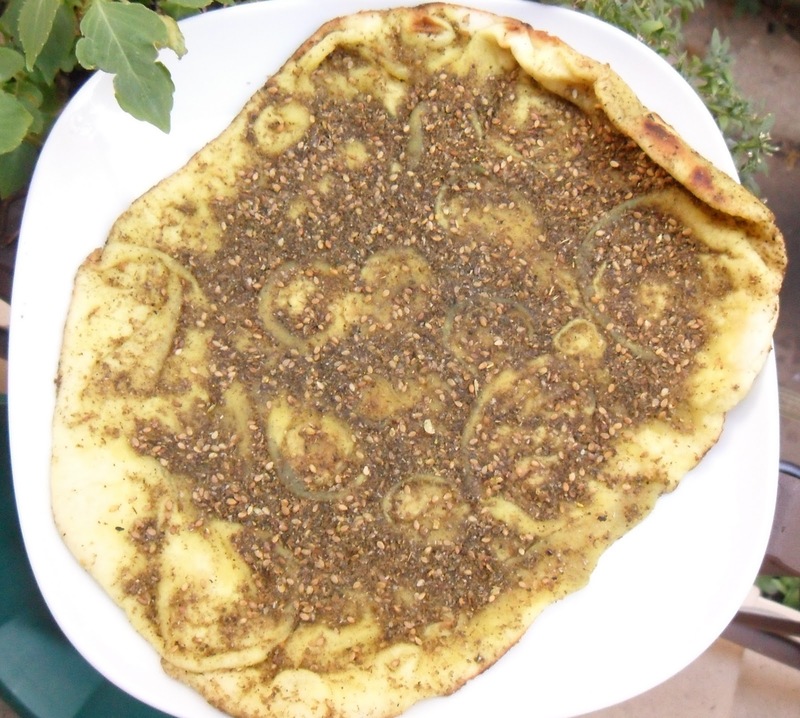 Menaesh is a flat bread covered in a paste of thyme, oregano, vegetable oil, sesame seeds and lemon juice (though the lemon juice wasn’t listed on the package, you could definitely taste it). I am at a loss in finding anything more about it online but this is how it was spelled on the package, fresh from the bakery. From the little information I could find online (and comparing it to what I tasted) I’m pretty sure the topping is actually Za’atar (zaatar), a mixture of sumac, sesame seed and herbs frequently used in the Middle East and Mediterranean areas. It was delicious!